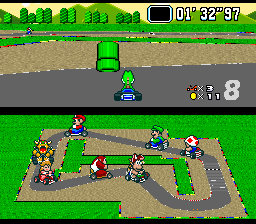 After the single-player-only F-Zero launched alongside the Super Family Computer in 1990, Nintendo began tooling around with the idea of designing a racing game where two human-controlled drivers could compete on a course at the same time. 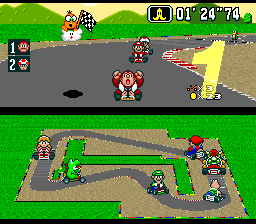 According to an April 2008 interview director Hideki Konno gave with Nintendo president Satoru Iwata, the first working prototype of what would eventually evolve into Super Mario Kart had not the famous Italian plumber behind the wheel but a nonspecific man sporting overalls. 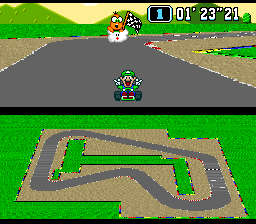 It wasn’t until three or four months into development when this sprite grew a mustache, and Mario and company officially joined the race. 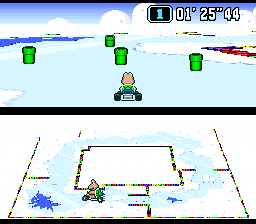 One of the first in-game items to follow was an oil can that could be thrown to spin out other karts. 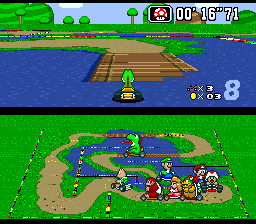 The developers, of course, later ditched this messy mechanic of polluting the Mushroom Kingdom with oil spills (four words: Koopa Beach, Exxon Valdez) in favor of having the player toss more eco-friendly, biodegradable banana peels instead (link). 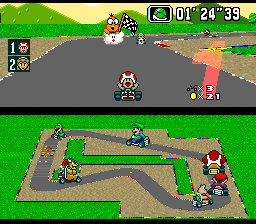 A few months after Konno spoke about the early history of Super Mario Kart, the prolific Dutch collector Niels Thomassen went to task on selling hundreds of his accumulated classic video game prototypes online in a giant fire sale, the likes of which had never been seen before or since. 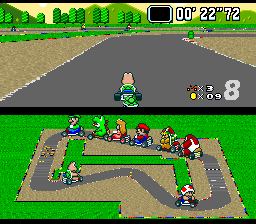 Among the Earthbound prototypes and unreleased game treasure were two copies of Super Mario Kart on Super Nintendo development hardware. 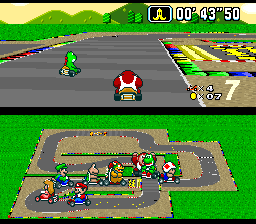 One was eventually found to be identical to the US release (thanks to the work of SuperFamicom.org webmaster Matthew Callis [link]), while the other showed more promise given this description that accompanied it: “much harder and has small differences” (link). That version, which had previously come from former Tips & Tricks magazine Senior Editor Jason Wilson, was snatched up just four days after Thomassen initially announced his desire to part with much of his collection. 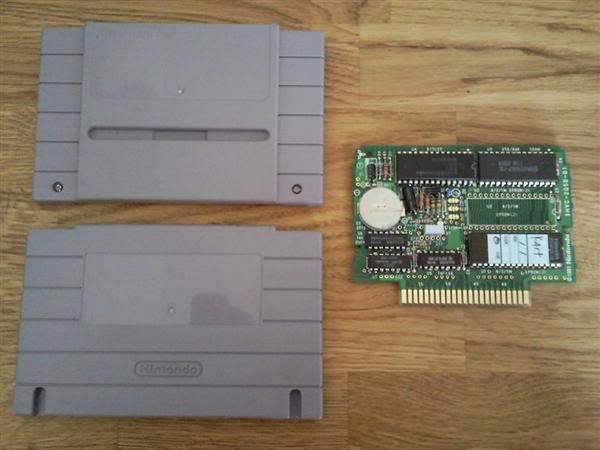 The buyer, a Swedish Nintendo prototype enthusiast by the name of Johan, emerged a couple of months later on the Digital Press message board to report about his new acquisition (link). 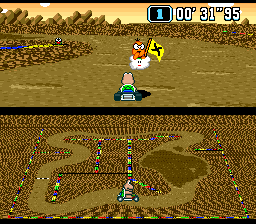 Unlike some behind-the-scenes beta collectors who are regrettably about as approachable and accommodating as an electrified barbed-wire fence, Johan willingly took it upon himself to make public his findings and share them with other gamers, treating fans of the 1992 kart racer to screenshots, demonstration videos, and audio recordings that showcased the differences he had unearthed so far. For his efforts, he was met with the lionhearted whines of “Let’s take the disgusting hoarder’s ROM by force!” that soon derailed the discussion. After the orangey monsoon clouds of Cheetos cheese dust cleared, it wouldn’t at all be surprising if a few onlooking parties privy to private prototype information clenched their lips and/or sphincters a tiny bit tighter as a result of the six-page outburst. Receiving threats and other forms of virtual vitriol has become a rite of passage for many prototype owners. Over the Internet, the Ring of Gyges Rent-A-Center, this general bad behavior has simply come to be expected–even if, as in the case of Johan, one attempts to field questions and satisfy curiosities. 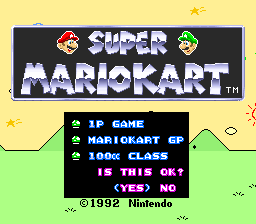 Nothing more was learned about this prototype since the Digital Press thread died down in 2009, despite Super Mario Kart remaining one of the most requested classic game betas around. To pick up where Johan left off, I sent over a list of all the changes I had noticed from a careful study of his various pictures and media uploads, and he replied courteously enough by providing some more insight. 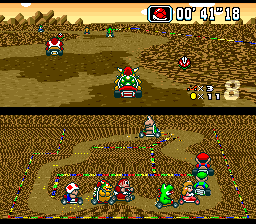 Gear up and get ready, as this Super Mario Kart prototype provides a rare and exciting inside glimpse into the first entry of one of Nintendo’s biggest and most lauded franchises. 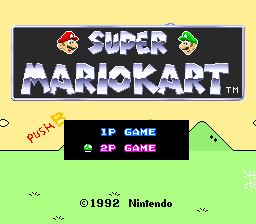 Right off the bat, the trademark symbol on the title screen is above, not below, the “T.” Mario’s mouth also looks slightly altered on the title screen. 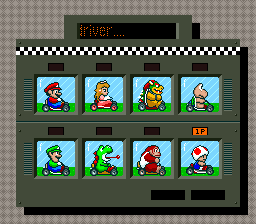 On the Select a Driver screen, Mario and Luigi have different rear-ends on their karts, and Bowser’s sprite appears to be changed as well. 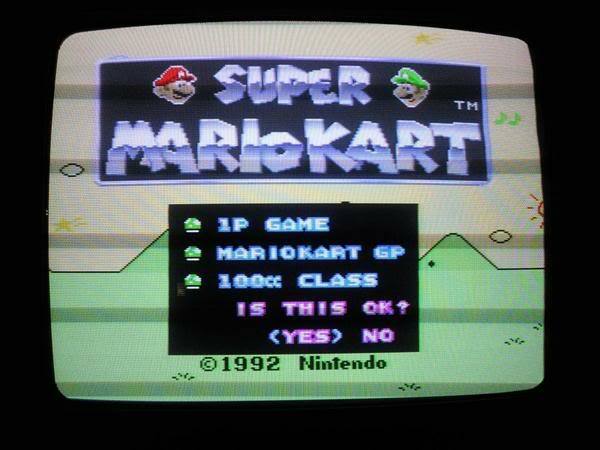 On both the title screen and player select screen, Bowser’s lower jaw is sticking out a little bit more. 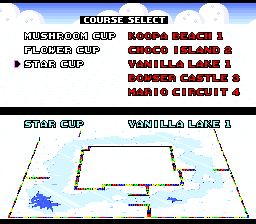 There’s no patterned border or mention of the racing class on the Cup Race select screen. 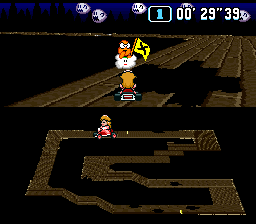 The Cheep Cheep sprites flop upside down. 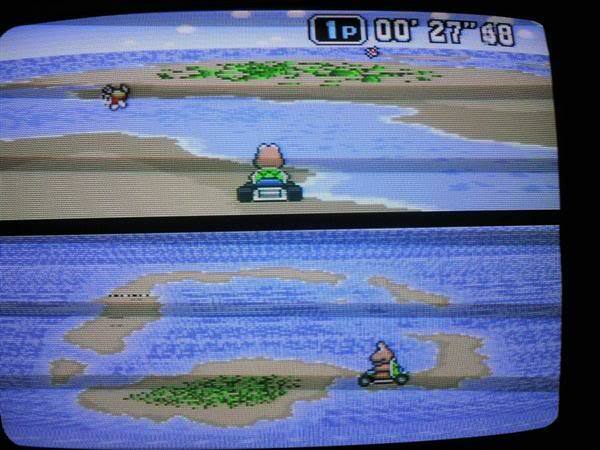 Koopa Beach 1 has much thicker patches of seaweed. 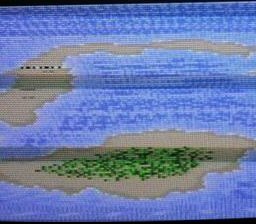 The shoreline waves in Koopa Beach have not yet been animated. 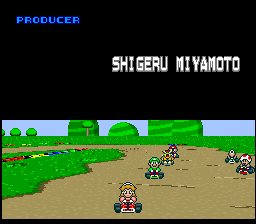 The Results screen shows “OUT” for the players who didn’t manage to make it past the finish line in time. 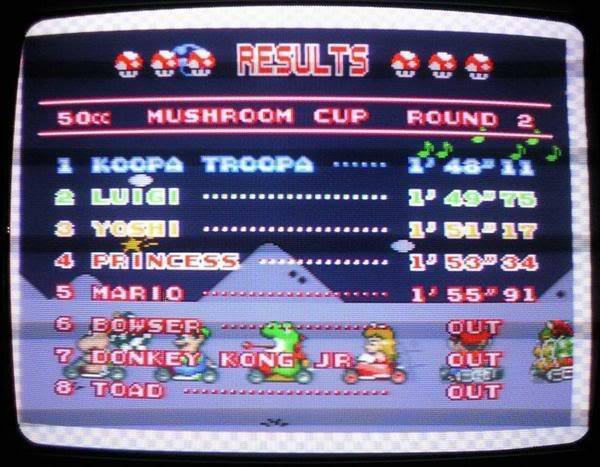 When coming in second place at the end of a Cup Race, a Super Koopa flies in a loop and is then hit by the champagne cork. 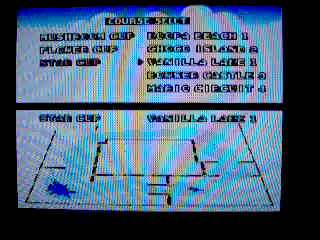 The player is not awarded a cup. 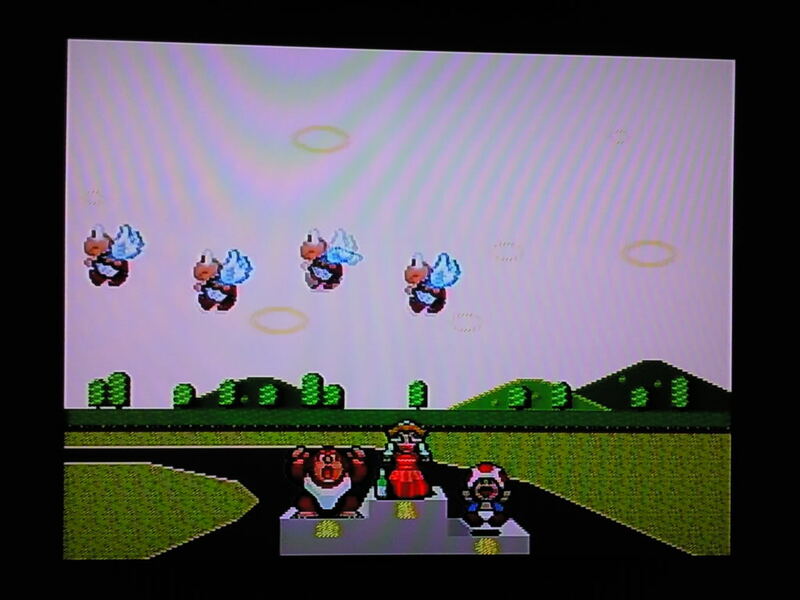 When coming in third place, four Flying Koopas appear overhead, the last of which gets shot down by the cork. 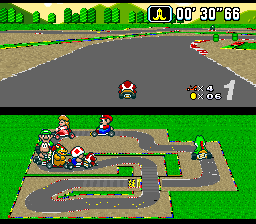 The color palettes are sometimes different during the podium sequence. 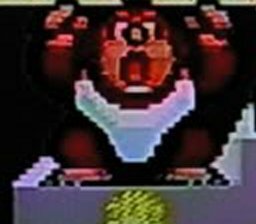 Also during the podium sequence, Donkey Kong Jr. is missing the letter on his white tank top. 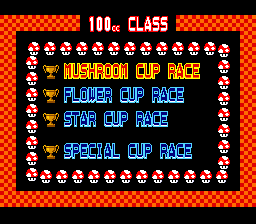 There are no credits after finishing Special Cup, and 150cc mode does not unlock. 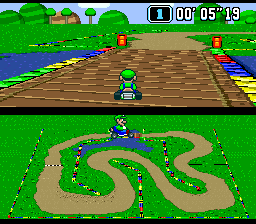 Vanilla Lake 1 contains two additional straight multicolored track walls right before the small blue lake. 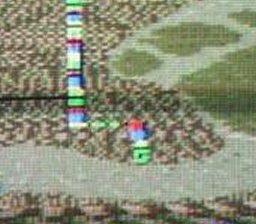 There’s also an additional straight multicolored track wall before the large blue lake. 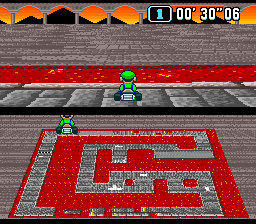 The green pipes here are positioned differently, too. The Replay option has not been implemented yet in Time Trial. 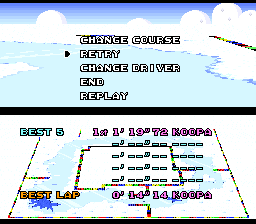 The left-side text on the Time Trial menus is white but flashes red. In the retail, the text is red but flashes white. 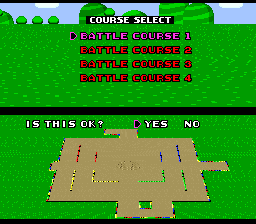 Also, the “Course Select” text at the top of the screen is misspelled “Course Selct” on the Time Trial and Battle Mode menus. 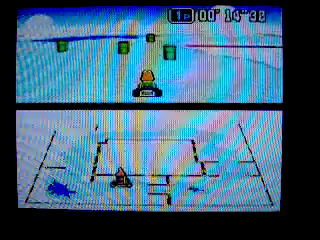 After crossing the finish line in a Time Trail race, the driver wildly bangs into walls when the computer assumes control. 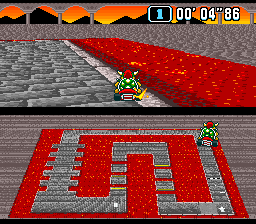 The prototype has the addition of Choco Island Battle Course 3, which was removed in favor of Battle Course 1 in the retail game. 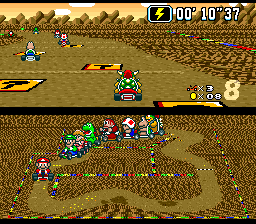 Going out-of-bounds in Battle Course 3 causes a buggy Lakitu to unsuccessfully try towing the player back to the playing field. 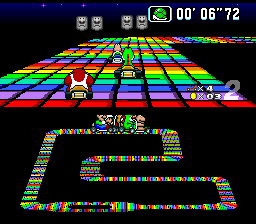 Rainbow Road is narrower in the prototype, causing computer-controlled drivers to constantly fall off. 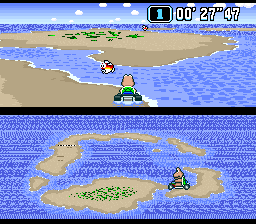 Computer-controlled drivers often sink into the water while crossing the broken bridge in Donut Plains 3. 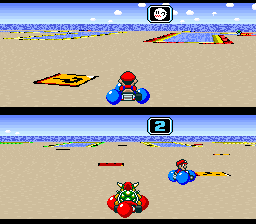 The player cannot drop Green Shells or shoot Banana Peels. There’s no speed boosting at the beginning of races. 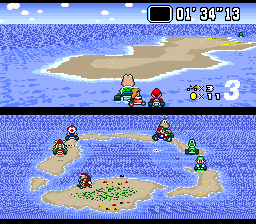 Only one gameplay demonstration scene plays during the intro, as opposed to four in the retail. 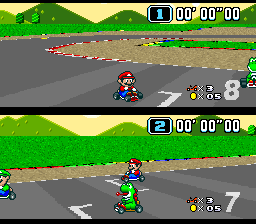 Strangely enough, it is also possible to slightly change Mario and Yoshi’s steering during the few seconds that the demonstration is playing by holding either “L” or “R” (both buttons have the same effect). Nothing happens when pressing “Select” at the menu screens. 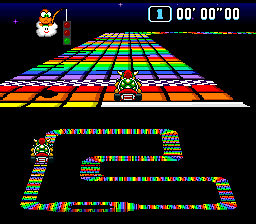 On Bowser’s Castle 3 in Time Trial mode, there’s a multi-colored track wall in the middle of the three lanes at the end of the course which, needless to say, seems more than a little misplaced. 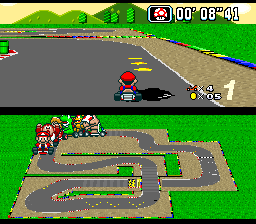 Shrunken drivers cannot be run over by opponents. 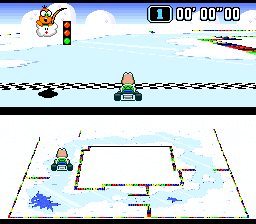 If the player collides with a pipe while being invincible, the kart will make a feather jump over the obstacle instead of knocking it off the screen. 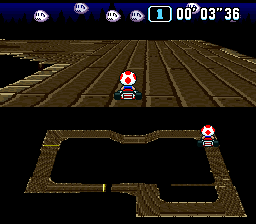 There’s no carving ability for Toad or Koopa Troopa like in the retail release for some courses such as Mario Circuit, Ghost Valley, and Bowser’s Castle. 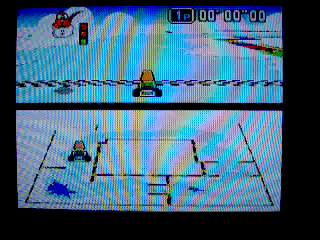 Instead, they can only skid just like the other racers. 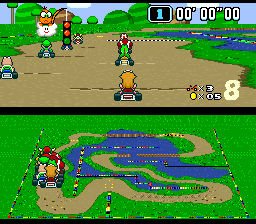 Unlike the retail game, it is possible to drive around endlessly in circles without spinning out. 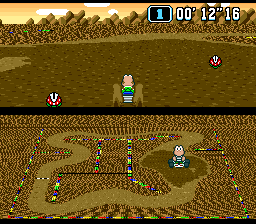 There’s a dry path through the middle of the wet mud in Choco Island 2. 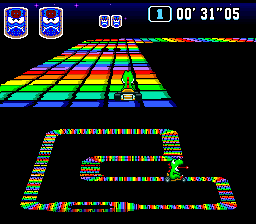 Before reaching that mud in Choco Island 2, the multicolored track protrudes straight out. 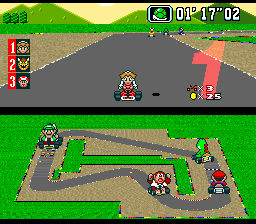 In the retail game, that track curves to the right. 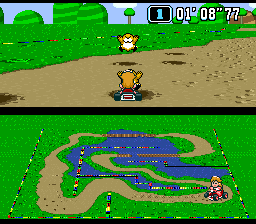 The muddy sections of Choco Island makes driving feel more slippery in the prototype. 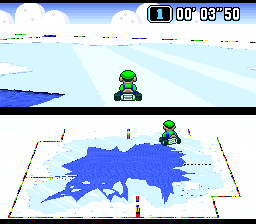 The wheels on Luigi’s kart keep rolling even when he stays in neutral. 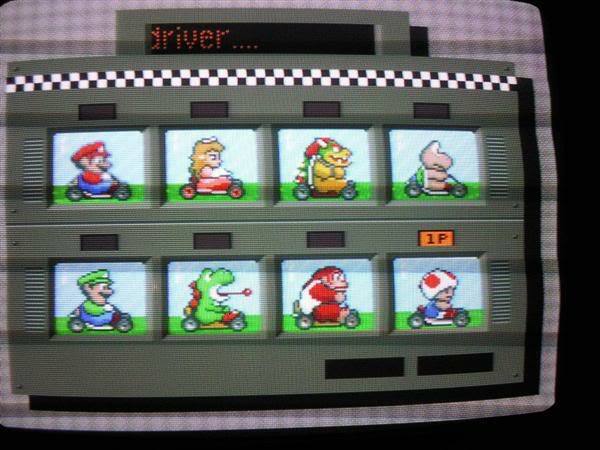 Extra lives are not given out in the prototype. 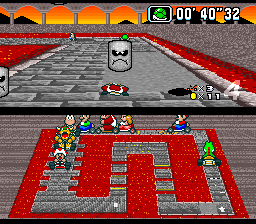 The Thwomps on Bowser’s Castle and Rainbow Road start to go up and down immediately, unlike the retail game where they become active only after completing the first lap. 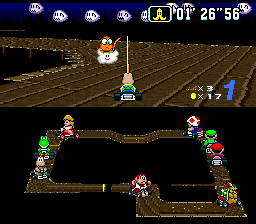 No sparking Thwomps are present in the prototype–only the regular ones, even on Rainbow Road. 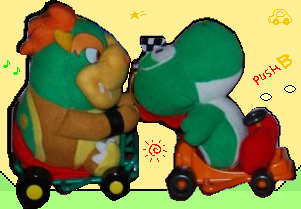 Lakitu never charges any coins when he picks up a player in the prototype. 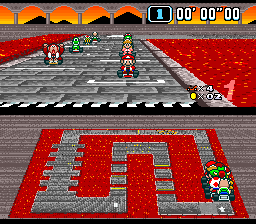 The oil spills on Mario Circuit do not cause the player to spin out. 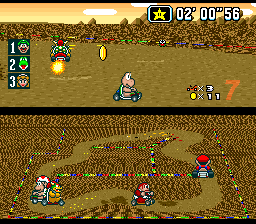 When colliding with Gophers on Donut Plains, the player spins out and loses coins. 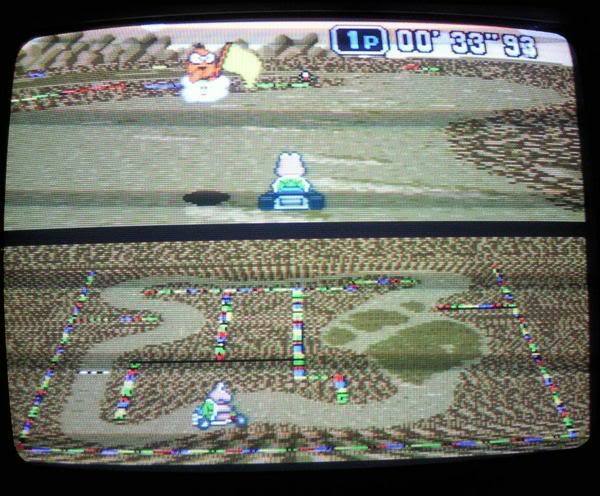 The Gophers do not become stuck in front of the player like in the retail game. 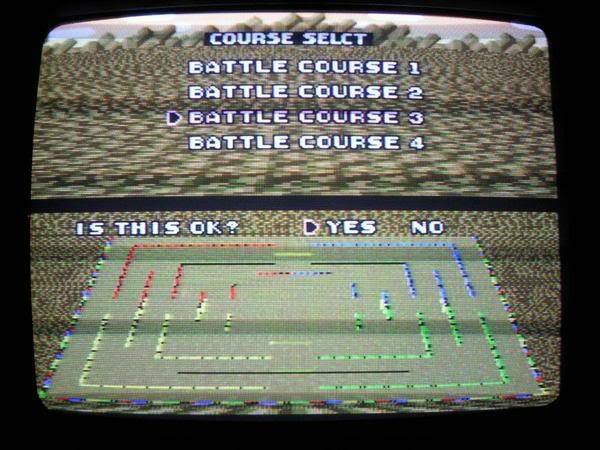 Although the Lightning Bolt item flashes by in the item box in the prototype, the game never stops on it. 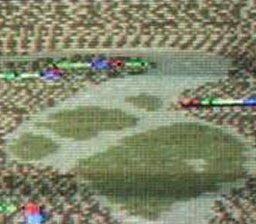 The player jumps slightly higher when pressing “L” or “R” in the prototype. Different music plays during both Vanilla Lake courses (link). 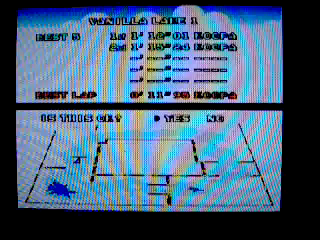 Donkey Kong Jr. has different victory music (link). 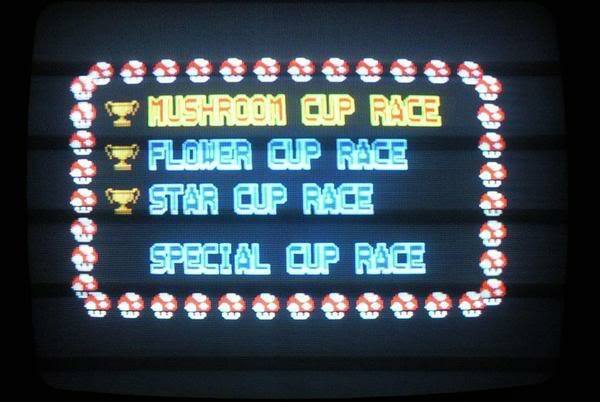 Toad and Princess Peach’s victory themes are also a bit different. 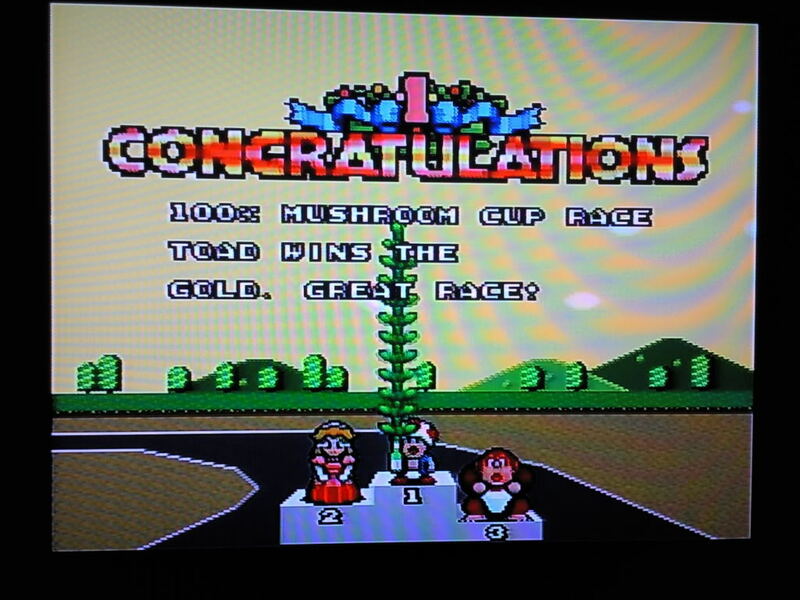 It seems that Toad’s victory theme is missing a few instruments, while Princess Peach’s victory theme has a bass line that isn’t present in the retail game. 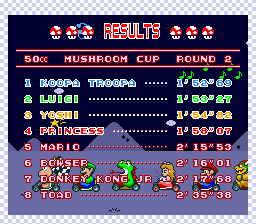 Toad and Yoshi’s victory themes also play quite a bit slower. 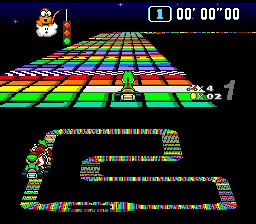 Bowser’s Castle soundtrack plays during the Rainbow Road course. 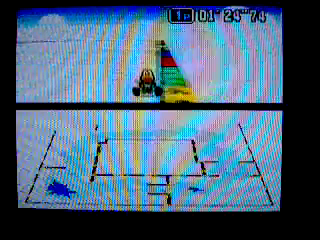 Lakitu makes a different sound when the player drives in the wrong direction. The sound for using the Ghost item in Battle Mode is different and a lot shorter than the one in the retail game. There’s a different sound for when going back to normal size after having been shrunken by a mushroom. 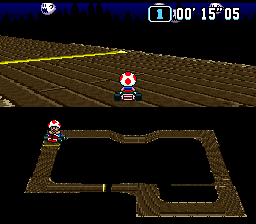 There’s no sound for crossing the wooden bridges on the Donut Plains courses, and no sound for driving over the rickety planks on the Ghost Valley courses. When getting mashed by a Thwomp, a strange sound can be heard that isn’t present in the retail game. 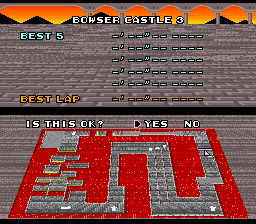 The sound for hitting a wall on Bowser’s Castle is slightly different. It sounds less “crunchy” in the prototype. 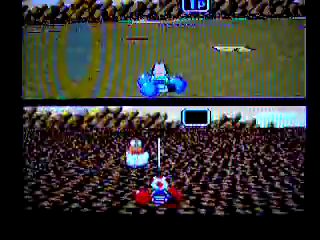 There’s also a different sound for every time an opponent pulls ahead of the player. 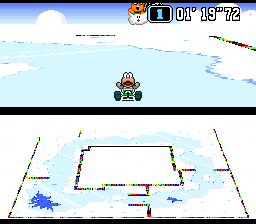 All surfaces appear to share the same Mario Circuit skidding sound. 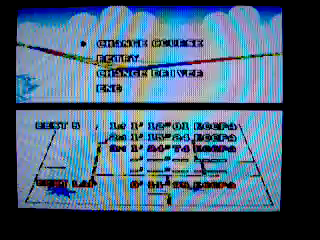 The Ghost Valley music plays a little slower and seems to be missing a few layers. 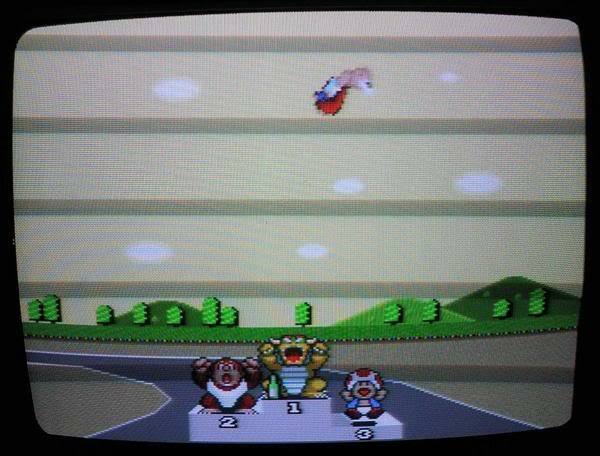 There’s no special podium music for coming in first, second, or third place. 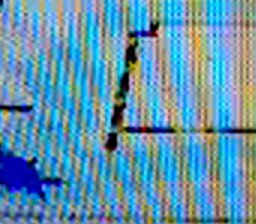 The fourth place music plays instead. 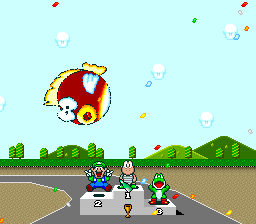 Also during the podium scene, there’s a different sound for when the giant inflated Cheep Cheep gets popped by the champagne cork and flies away. 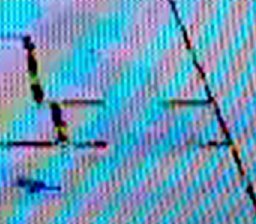 Its subsequent flight path is also somewhat different.